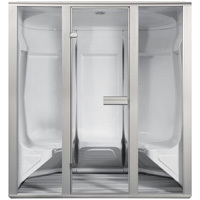 A steam room, steam bath or steam shower is a unique and luxurious experience that can be achieved much more practically than ever before, as residential steam generators become not only more compact but more affordable. As well, improvements in commercial grade steam generators make it possible for resort, spa and health club owners to provide their clients with an unforgettable steam bathing experience, without unnecessary concern for the dependability of their steam generator unit. Steam rooms and steam showers are not only relaxing and energy-renewing, but they promote health and beauty too. Recommended for such conditions as bronchitis, catarrh, rheumatic complaints and joint pain, it can also be beneficial for people suffering from poor skin circulation, sleeping disorders and dry, chapped skin, among others. Aqualine are pleased to be able to offer an extensive range of high quality modular steam baths made by ourexpert Finnish partners Harvia. 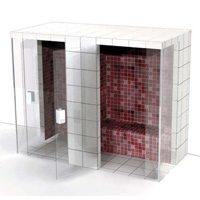 These steam rooms are manufactured from extruded polystyrene and their modular design makes them easy to install. Contact the Aqualine Wellness Team to discuss our bespoke design, supply and installation service.